‘By carving away the top white layer the dark layer at the bottom is revealed, thus creating contrast.’, tells me the cameo maker as his fingers nimbly work on the oval piece of shell with a sharp chisel. With delicate yet decisive movements he is refining the profile of a young woman. 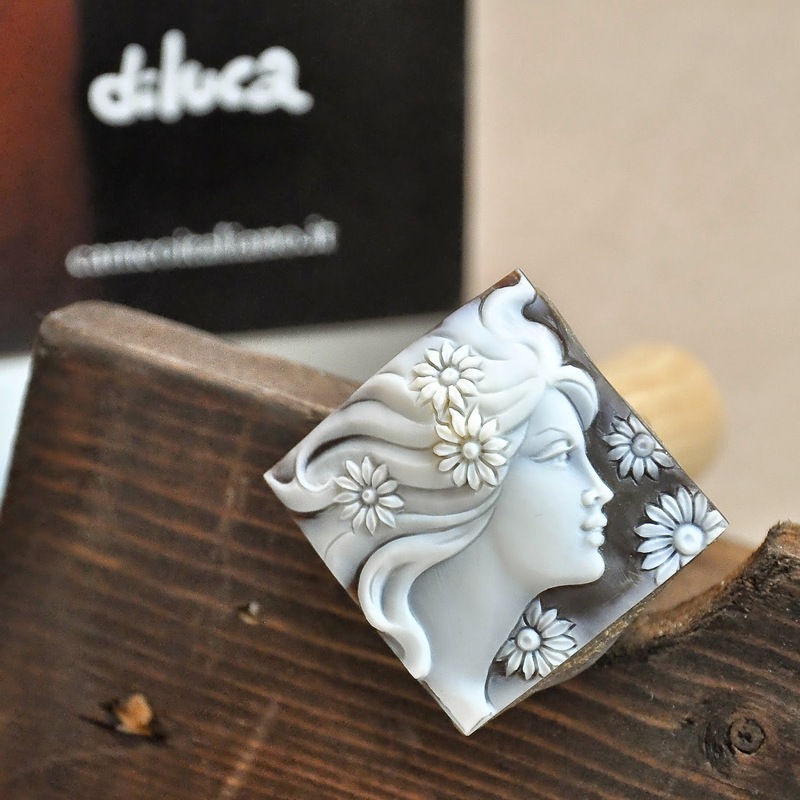 The flowers in her flowing hair have been painstakingly carved petal by petal. Now he is working on the background, smoothing the area around the neck, so as to emphasise the three-dimensionality of the design. Once finished, the cameo will be inviting admiring glances and the irresistible desire to stroke it in order to feel its texture. It will be several days before this cameo is completed though. 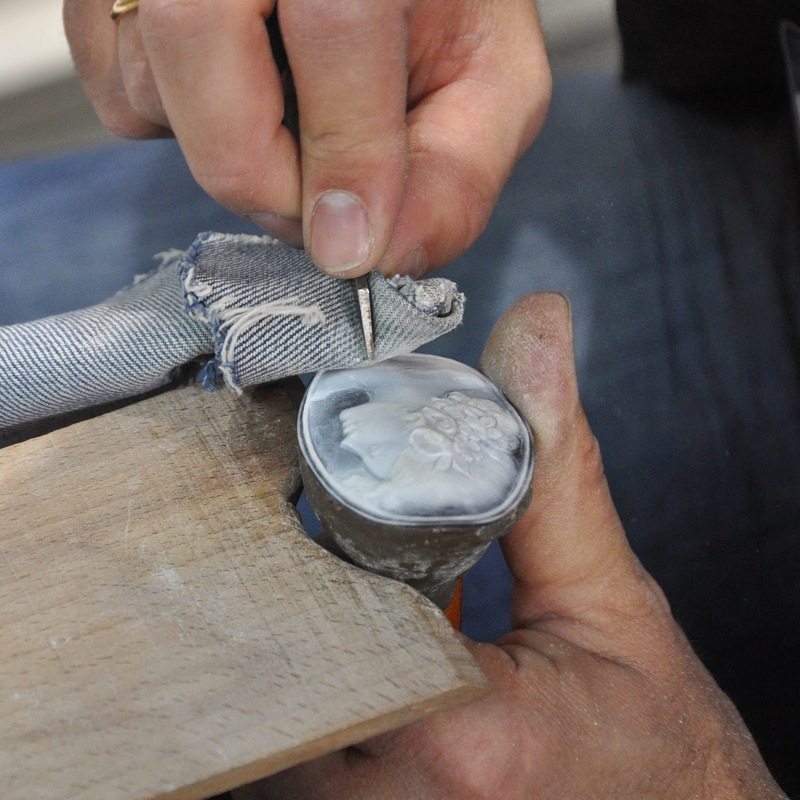 In a process where everything is done by hand following centuries-old techniques, the most complex cameo designs can easily take a month from start to end. 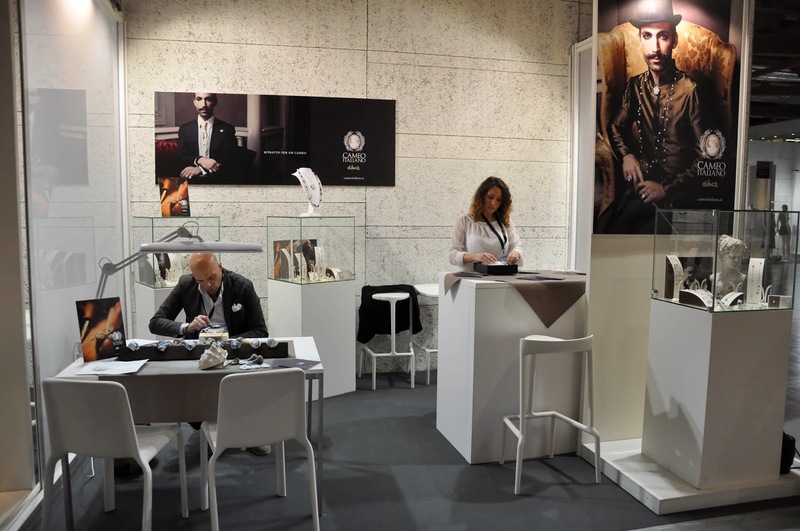 I was at Origin – an innovative fair in Vicenza – where independent designers from all over the world exhibit side by side with Italian fashion manufacturers. I was slowly browsing through the booths showcasing bold creations when in the jewellery section of the fair I came across the cameo maker. Signore Ventresca was working at his bench. Various chisels and other tools of his trade were artfully spread in front of him. 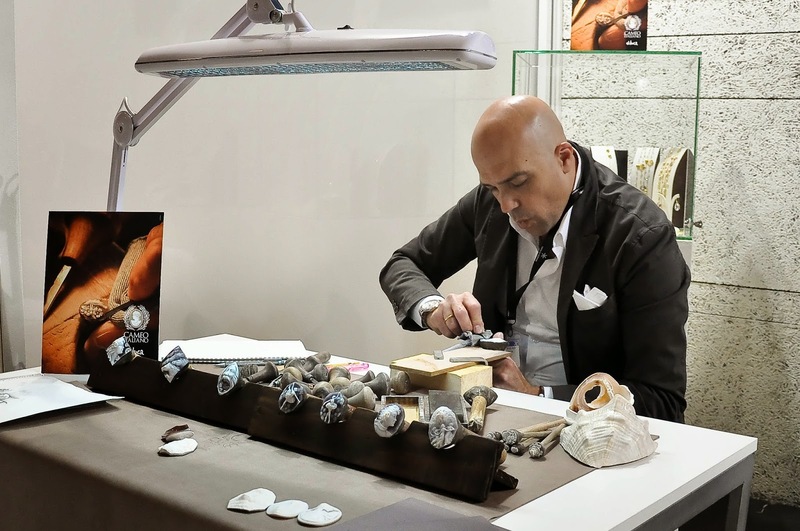 Behind him were the glass stands with the gold and silver jewellery designs incorporating the finished cameos under the brand Cameo Italiano di Luca. I couldn’t simply walk past. Making cameos is a millennia-old art which nowadays is so rare that it is almost shrouded in mystery. 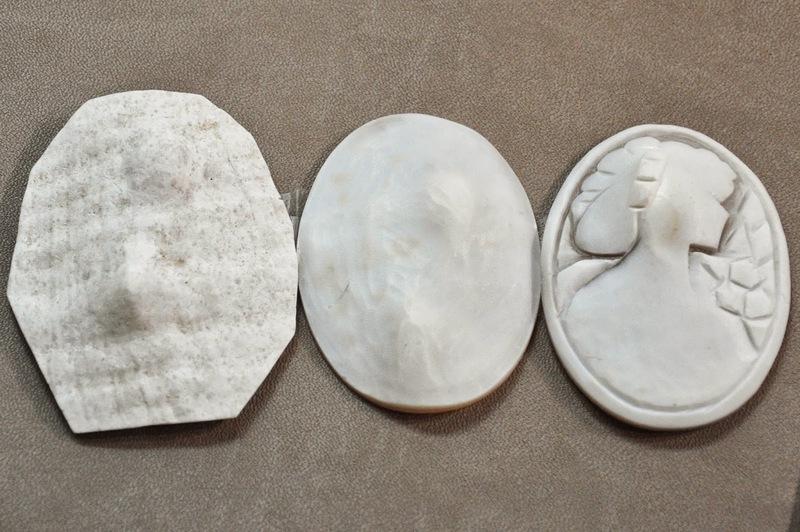 Plus Italy is renowned as the place with the finest shell cameo hand carving technique. I was at the right place at the right time to learn a bit more about cameos and I wasn’t going to miss my chance. ‘It all starts with the shell!’, said Sig. Ventresca. The large emperor or queen’s helmet shell is fished in the Caribbean and then shipped to Italy. Its rugged surface is whitish in colour, whilst on the inside it is a rich orange-brown hue. The cameo maker picked a large shell from its bench and showed me the circles, ovals and squares marked on the inside of it. He explained that they are sawn off, their top surface is smoothed and their edges refined. 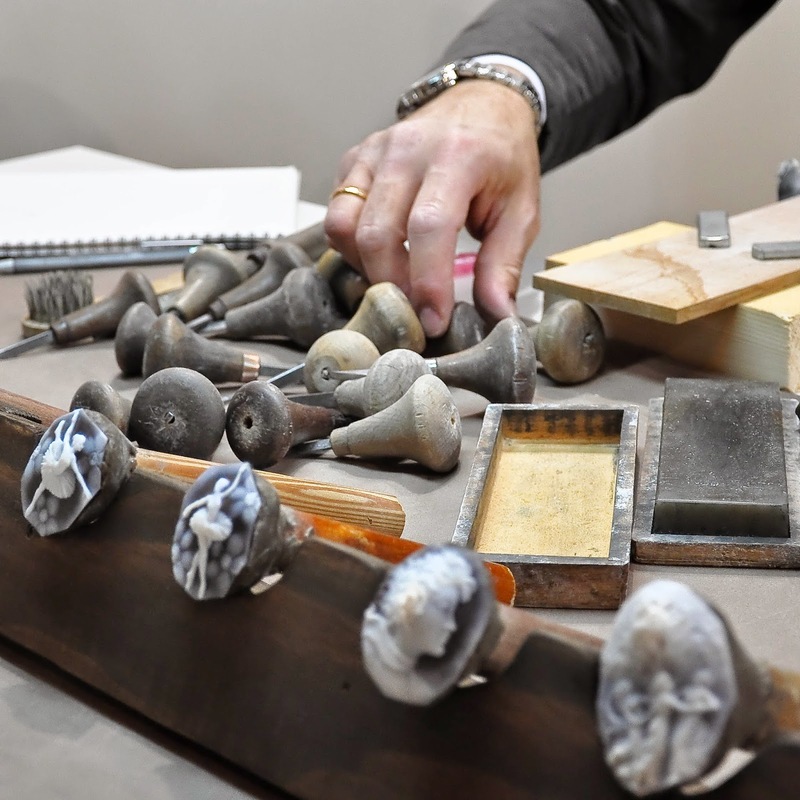 Then the shell blanks are attached to a tool with a long wooden handle, making it easy to hold them and rotate them. The actual carving work can now begin. 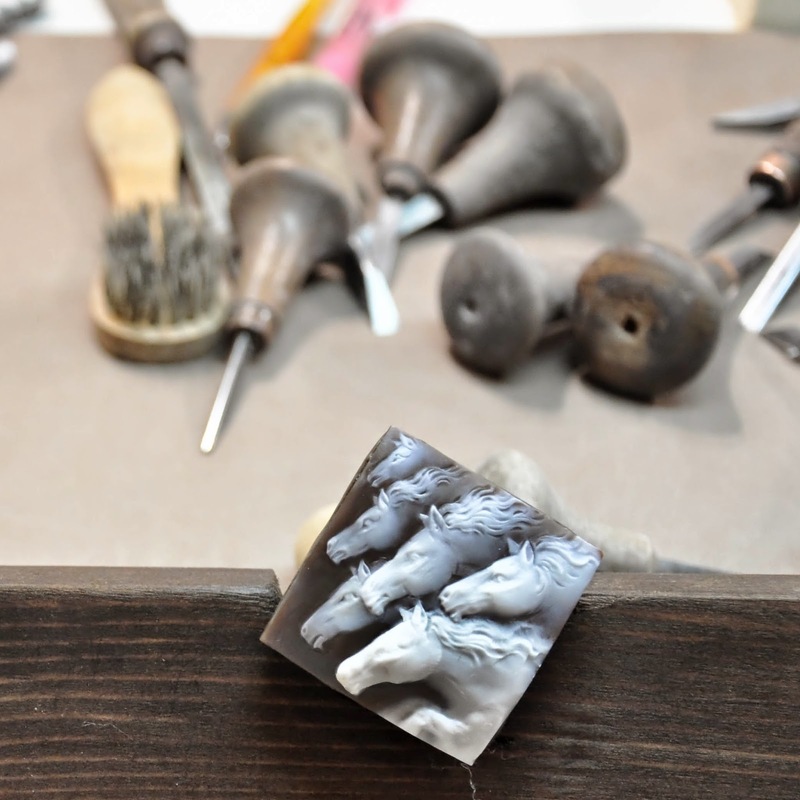 Chisels with different widths are used to outline and then carefully cut out the design. The chisels have round handles to make it easy to hold them tight in a clenched hand. As he was explaining all this to me, the hands of the cameo maker kept working on his design. 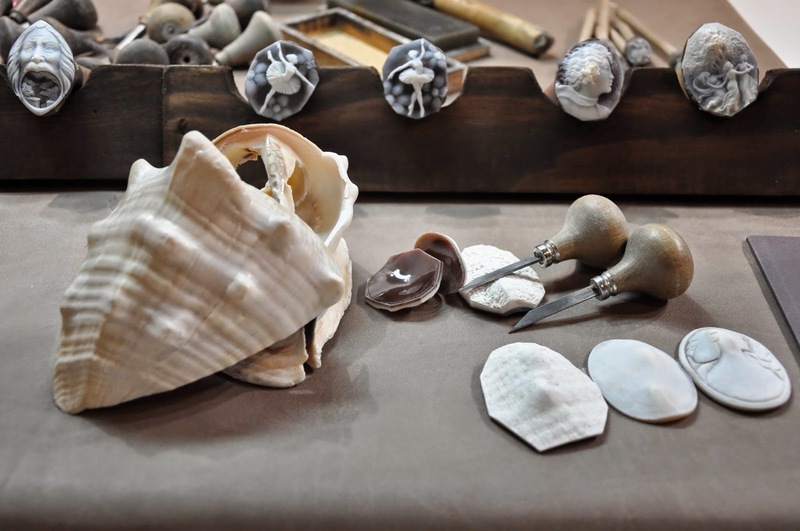 He would pick a chisel, delicately file off the surface of the shell and then pick a finer chisel to refine even better a tiny detail. I stood silently just watching him work for a bit. Carving the shell seemed almost a contemplative task. The cameo maker was whistling quietly to himself and I admired the ability to create a complicated design out of an organic shell which had first been shaped by the constant motion and pressure of the sea and now was being turned into an object of art by a human hand. I also realised that the process in front of my eyes was very old and didn’t rely on heavy machines and conveyor belts. Instead, with a few simple tools a person was able to create something beautiful and unique. Just then the cameo maker drew my attention to a little detail. He explained that nowadays a piece of denim is used to support the chisel as the maker files the shell away. The reason for this is that denim doesn’t wear and tear easily, hence the cameo maker can use it for quite some time instead of constantly changing the cloth and slowing down the process even more. I loved this modern improvement on a process which is several millennia old. It brings cameos into a contemporary context and shows that making them is still very much a living breathing art. I really enjoyed my little foray into the world of cameo making. 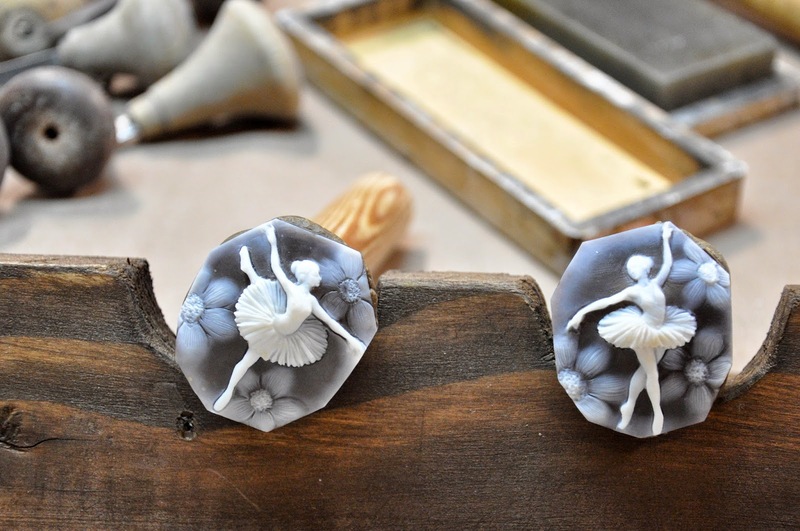 Learning about how one of these little treasures is made and the several steps through which the artisan takes a little piece of shell to turn it into a stunning adornment made me see cameos in a completely new light.